Project resource planning is a key part of successful project management and can be akin to chess when you find yourself having to juggle resources around in an effort to get work done. It also is an area where a project manager has the chance to demonstrate their "soft skills" of negotation and communication. Do you have a project plan which includes milestones and phases? If not then it's going to be hard to work out what resources you will need. So write the plan first and then put the resources in (specific names or generic titles) as demonstrated in the example below. 2.0 What Resources will be Required? Now you will determine this with your Workstream Leads. However just because they tell you they will need 10 developers to do the work, does not mean that 10 developers with the right skill-set are available. You need to find them and get them allocated. On most projects there will be few resources who will be full-time on the project during the entire lifecycle. Most will be full-time for a time and then move to part-time. Examples of this are developers, testers and business analysts. Others including support staff will be part-time for the entirety of the project.These would include environments, deployment, networking, IT security and operations amongst others. Now one thing to remember is that it isn't a case of being 100% or 50% of the time on a project. You can specify other percentages for resources. So for example for certain teams I will allocate a resource 1/2 a day per week during the project lifecycle which works out as 10% of their time. This means their cost and time is allocated and means should anything happen you're covered. There is nothing worse than finding you have a problem and the only team which can solve it for you has no-one available because you didn't bother to allocate any project time for them. Is this a project whereby there is an overlap of expertise and work. So for example there are certain projects where a tester can conduct all the testing involved. On other projects you will need specialist testers. So for example one those who have experience in UAT (User Acceptance Testing), Accessibility Testing, System Testing, Business System Testing and even Integration Testing. Obviously if the work involved isn't too specialised then you can utilise the same resources for the a wide variety of work which makes your life easier as you have to allocate less resources. Of course the more complicated and specialised the project is the harder this task becomes because of the need to have many more resources on the project for short periods of time to small pieces of work. This is of course needs much more management and expertise to pull off. 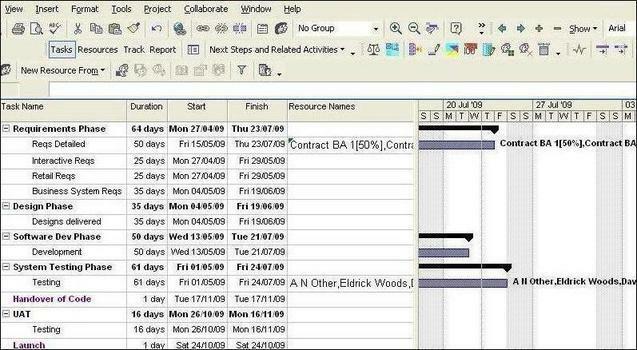 Now obviously Project Resource Planning is a complicated area and we go into it in more detail specifically with How to Write a Project Plan - Resource Type & Quantity Required. If you are running a business critical, high profile project then getting resources will be easy for the simple reason that you can pull rank on every other project manager. But most projects are not like that and getting resources is an ongoing fight. Remember that in a matrix managed environment, where everyone works on a variety of projects there is no guarantee your work will be done as often resources end up having to juggle 20 tasks at the sametime. So remember to be at your most charming and flattering as usually it is for this reason resources will prioritse your work over others. Alternatively you can just be very loud and argumentative in which case your work will get done on time, but you won't want to see what has been written about you on the toilet walls!! The key thing is as soon as you know which part-time resources you will be needing start talking with them. Get them enthused about your project and then you should find your project resource planning going much more smoothly.